Project Nomad was roaring along quite happily until we hit a major hiccup in the delivery of a crucial part – the floor pan. While we wait for it I thought it would be a good time to give you an insight into the budget for the restoration. Often when you read about restorations in magazines and on the internet you never get the full story on the total investment involved. I don’t know if this is due to the owner feeling silly because some readers might think “you spent what to restore that!” or if they are just trying to hide the facts from the misses. You only have to walk around a major car show to realise that some owners go totally over the top on their ride and the investment in most cases is large. 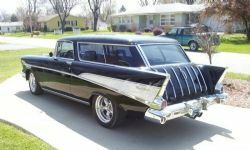 As I stated in a previous article I could have owned a 1957 Chevrolet Nomad for a lot less money had I bought one fully restored. On eBay, Hemmings and other sites in the US you can find what appear to be excellent examples for around fifty thousand dollars. Today I notice there are about fifteen tri five Nomads on eBay in the US ranging from sixteen and a half thousand to ninety nine and half thousand (buy it now price). The lower figure is a rust bucket and needs everything, the 56 at just under a hundred thousand is a sensational looking resto-mod with all the goodies. The point of this exercise is I wanted to do it myself, utilise the gurus to showcase their skills and have the car built the way I wanted it. 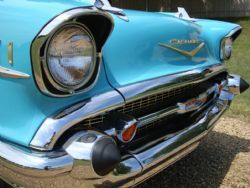 This includes all the mechanical components like four wheel disk brakes, power booster, brake lines and hoses, drop spindles, new drive shaft, LS2 engine, alternator, wire harness, ECU, valve covers, starter motor, gearbox, pulleys, petrol tank, fuel lines, motor mounts, adapter plates, exhaust, clutch, diff, axles, posi, wheels and tyres, body mounts, transmission cross member, full suspension incorporating narrow A arms, coil overs, sway bars, four link etc. This had to have its own category due to the amount of chrome and alloy trim pieces on a Nomad. The exterior covers all emblems and script, chrome and alloy bright work, lights, mouldings, fasteners, clips, bolts, glass and seals. Dash, gauges, electric windows, climate control, door bits like striker plates, lock knobs, handles etc. All the electrical components including rewiring the car, dome lights, all new switches, stereo, weather-strips, pedals, upholstery, headliner, seats and console.